Fascinating speakers. Breakfast & lunch. In support of the Southern Foodways Alliance. An all-day event filled with meaty speakers, lots of learning, a whole lot of laughing and, of course, all the bacon you can eat! Bacon lovers from around the globe trek to the Camp Bacon® Main Event to meet and eat and share their love for really good cured pork in a day filled with presentations by bacon producers, food experts, and a few fun surprise guests. In addition to all-you-can-eat bacon, the Main Event includes a swag bag, full breakfast, and an even fuller lunch. $15 dollars from each ticket will be donated to SFA to further their amazing work. Doors and cash bar open at 6:00pm. Program begins at 6:30. Bakin’ with Bacon at BAKE! We’ll be using the power of bacon to flavor three amazing baked goods, all in honor of Zingerman’s Guide to Better Bacon (available at all Zingerman’s locations). You’ll make a similar version of our wildly popular peppered bacon farm bread, bacon cheddar scones found in the book, and sweet and salty bacon pecan sandy cookies. We’ll take you to hog heaven with a demonstration of our maple glazed bacon apple doughnuts. Try and contain yourself. You’ll leave BAKE! with our recipes, the knowledge to recreate them at home, two loaves of bread, a dozen scones, three dozen cookies and great coupons. A whirlwind of fire and flavor takes the Roadhouse by storm! Brace yourselves for what will be the boldest and tastiest Bacon Ball yet! The Roadhouse can’t wait to welcome Tony Fiasche, co-owner of Tempesta Market in Chicago. Dubbed the “Sausage Kings of Chicago” by Foodable, Tony and his father Agostino continue a tradition of five generations of Calabrian salumi-making. It’s an art that requires as much balance as a proper tarantella. A dance of flavor and flame, ‘nduja is a spreadable salumi blended from Calabrian sweet and spicy peppers and pork. The Roadhouse has been using it on our menu for well over a year in our mussels, and it’s been a huge hit. We love it because it’s simple and good—the quality of the 100% Berkshire pork really comes through in every bite, along with a taste of family tradition. For our 10th Annual Bacon Ball, Tony has put together a menu that will spread the love of his famed ‘nduja, and also highlight the award-winning artisan meats he crafts from humanely-raised heritage pigs–including bacon of course! These meats are sold by Tempesta to fans and chefs all over the country, and are also available at Tony’s deli in Chicago, Tempesta Market. A deli-owner? At Zingerman’s? We can’t wait. Tempesta in Italian means “strong wind gusts”, and we are ready for blustery flavors whirling through the Roadhouse in May. Join us for a century-old Calabrian legacy, right here in Ann Arbor! 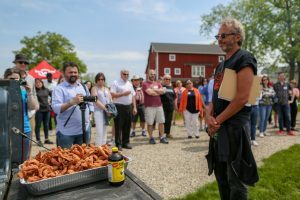 🥓 Camp Bacon is an annual event hosted across all the Zingerman’s Community of Businesses that celebrates the history, stories and love of BACON. We’re offering this JUST FOR KIDS tasting during the camp festivities to share some bacon love with a younger audience. You will learn to taste bacon like an expert as we work our way through the World of Bacon. We’ll tell you about some of our favorite bacon makers, learn about different types of bacon and talk about some of our favorite ways to enjoy it. Oh yeah, and we’ll eat some bacon! We think kids ages 4-14 would most enjoy this tasting. The cost is $15 per child. Parents are welcome to attend at no charge and observe on the sidelines. All participants will receive a 20% off coupon to use after the tasting to eat and/or shop at the Deli. Please include your child’s name, age and any allergy information in the comments field when you register. Thank you! Join our cheesemongers for a delicious evening of all things grilled & smoked! In honor of Camp Bacon, Guests will sample some of our favorite cheeses that have been either smoked or grilled. Guests will also get to indulge in our specialty bacon Pimento! Whilst savoring these delicious smokey delights, you will be sampling a variety of adult beverage pairings. Bread and additional accompaniments from our Cream Top Shop will be provided. We are over-the-moon ecstatic to be hosting Cured at Pearl’s chef Steve McHugh, four-time James Beard Foundation finalist for our Camp Bacon breakfast at Greyline! Hailing from a small Wisconsin town, he eventually made his way to San Antonio, Texas, after some time in New Orleans. Along with his wife, Sylvia, McHugh opened Cured at Pearl in late 2013 in the historic Pearl district. Cured makes use of the purest regional ingredients, paired with organic methods and is built on a foundation of lovingly hand-crafted cured foods, from charcuterie to pickles. Together with Southern Foodways Alliance and the Washtenaw County 4-H, which is certainly something to feel good about. We’ll announce the menu soon but for now, ya better secure your seats! Meet Mei Zhang, the author of Travels Through Dali: With a Leg of Ham and the founder of Wild China. Mei will open the doors to the wonders of Yunnan cuisine and its use of pork. She will share the history and traditions of the region and unveil the unique stories and recipes of those who call Yunnan home. Chef Ji Hye Kim will make you lunch from Mei’s book to share. Come and have some meat, meet Mei and learn about Yunnan food, all the while having a tasty lunch! Sign up for your spot now! A resident of Montpelier, Vermont, Jeff Roberts is president of Cow Creek Creative Ventures, dedicated to creating solutions in the areas of agriculture and food policy, conservation and the environment. He was co-founder and principal consultant at the Vermont Institute for Artisan Cheese at the University of Vermont. His new book Salted & Cured: Savoring the Culture, Heritage and Flavor of America’s Preserved Meats (Chelsea Green, 2017) examines the history and culture of dry-cured meat from 1630 to the present. As part of our Camp Bacon celebrations this year, we are excited to have Jeff join us at the Cream Top Shop for an evening of American cheese and charcuterie. Our cheesemongers have worked with Jeff to pair up selections of artisan and house-made cheeses with cured meats for a tasting that will fulfill all of your perfectly paired dreams. Bread and other accompaniments from our shop will be provided. Come on down to the market—just a block down from the Deli and Miss Kim!—to celebrate great pork with a three-hour street fair with an array of vendors selling, sampling and showcasing all things bacon. It’s a great way to have lunch, sample new bacon fares, or just have some fun with bacon-based games for kids of all ages. Cancellation policy: If you cancel more than 30 days prior to the event, you will receive a full refund. With 7 to 30 days notice, you will receive a 50 percent refund. No refunds can be offered with less than 7 days notice of cancellation. Thank you for your support and understanding.